France loose-head Thomas Domingo is set to miss the Rugby World Cup after suffering knee ligament damage in Clermont Auvergne's Top 14 win over Biarritz on Saturday. 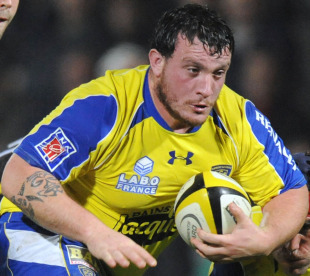 The 25-year-old prop, one of France's most consistent performers and a certainty for Marc Lievremont's World Cup squad, was injured in the 60th minute of his club's 41-13 victory at the Stade Marcel Michelin. News followed that he had ruptured cruciate ligaments in his right knee, with Clermont confirming that his season is over and that his World Cup hopes are 'severely compromised'. "His season with ASM Clermont Auvergne is now over and his chances of competing in the World Cup are severely compromised," a statement read. France have been drawn in Pool A for the tournament in New Zealand, alongside the hosts, Tonga, Canada and Japan. With Fabien Barcella yet to return from surgery on an Achilles injury it is unclear who Lievremont will turn to as back-up, with Biarritz veteran Sylvain Marconnet another oprtion.